Mgoun Sahara combined trip: A trip that will first take you through Berber villages in central high Atlas mountains. And followed by a couple of days to the Sahara desert. Combined High Atlas and Desert tour will allow you to experience remote parts of both the Atlas mountains and the Sahara desert. You will enjoy wild camping and the spectacular Mgoun river gorges. 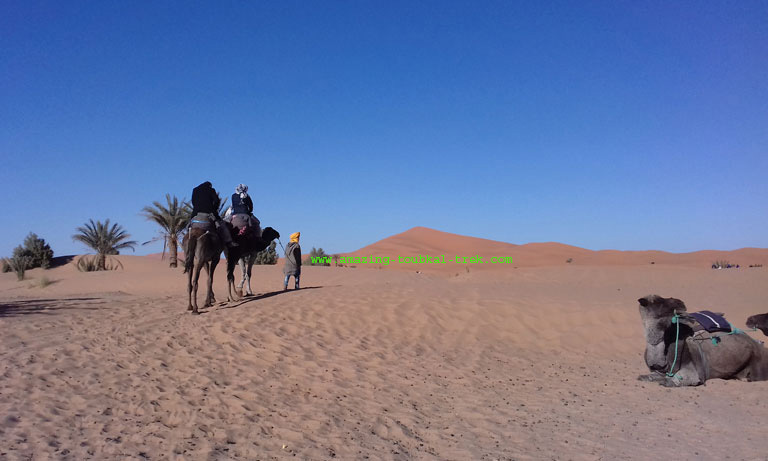 – Enjoy camel trekking in Merzouga and night in the desert camp. After breakfast, We start our journey to Ait Bougmez happy valley in the central High Atlas mountains. We will visit and take a great hike around the highest waterfalls of Morocco, Ouzoud. We will have lunch by the falls; then we carry on towards the valley, where we will stay for the night in a lovely local Guesthouse. 5 hours drive. After a good breakfast, we set off on our hike up along the Assif n’Ait Bougmez valley, passing through the terraces, up to Tizi n’Ait Imi 2905m. After lunch, we descend to Tighremt N’ait Ahmed on the bank of Assif Mgoun. Overnight in tents. 6 hours walk. 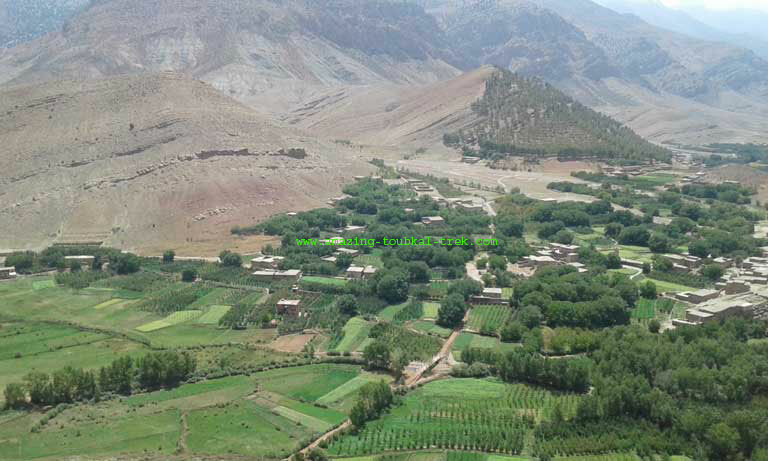 We continue after breakfast down along the Mgoun Valley and pass through several Berber villages of El Morabitine, Wawchki, and Ighrem Izderne. We will meet the local people of the valley, with traditional costumes and hairstyles of the Berber women. Overnight in tents. 6 hours walk. We will leave the camp early in the morning after breakfast. We cross the stream and enter a narrow gorge walking in water through towering narrow canyons. 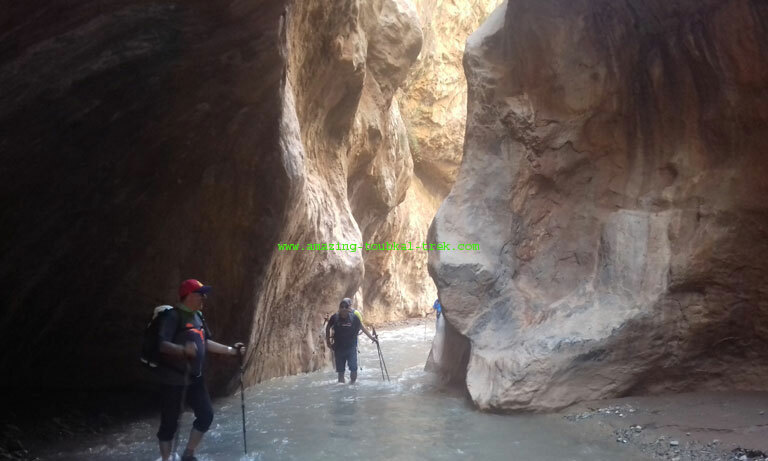 There is an alternative route to take, if the water is too deep in the canyons, we could make the Tizi n’ Ait Hamed pass. After Lunch at the exit of the canyons, we continue to Aguerzaka. We will spend the night camping in tents in Aguerzaka village. 6 hours trek. After breakfast, we continue our trek following Mgoun river, walking in water to the BouTaghrar Village. Overnight in local Guesthouse. 5 hours trek. After breakfast, we drive from roses valley to Merzouga. We will visit Todra gorges then drive to Rissani, Erfoud to arrive Merzouga dunes. After a short break at the hotel, you will ride camels through the golden Erg Chebbi dunes, and this is an excellent opportunity to take lovely pictures. We arrive at the camp, we enjoy the sunset and play drums around the campfire after feasting on a traditional Moroccan meal. Overnight in a nomadic style camp. 5 hours drive. We get up early in the morning to watch the sunrise; then you ride camels back to the hotel. 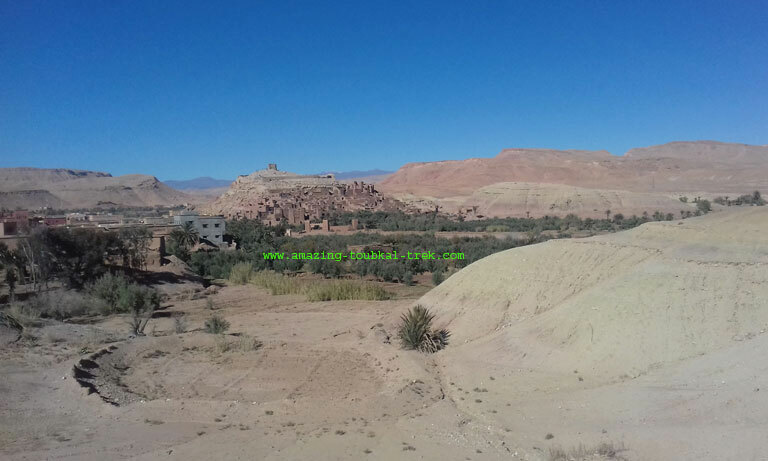 After an excellent breakfast and take a hot shower, we drive to Ait Benhaddou Ksar through a different road via Alnif, Tazarine, and N’kob till Ouarzazate, where we’ll have lunch. You will have the opportunity to hike around the Ksar and discover with your guide. Overnight in a hotel. 6 hours drive. After breakfast, we continue to Marrakech, crossing the Tizi n’Tichka pass (2260m altitude) and admire the landscape of Berber villages with some photo stops. Overnight in Marrakech hotel. 4 hours drive. – Mgoun Sahara combined trip is available and can be arranged for groups of all sizes. Mgoun Sahara combined trip: Combine both trekking through the Mgoun gorges and Sahara desert trip. Combined Mgoun and Sahara Desert, Atlas Mountain and Sahara Tour.